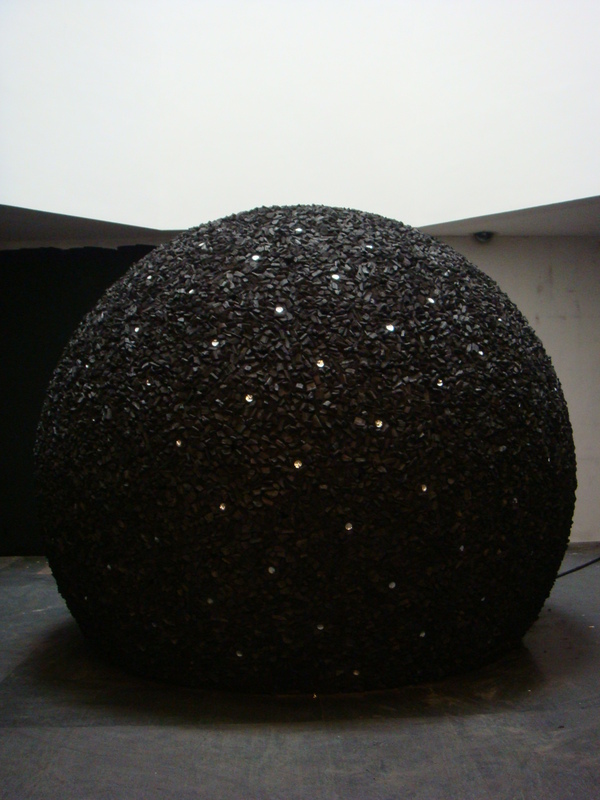 Amy Cheung’s Ashes unto Pearl is a 3 meter big hollow sphere with a charcoal surface. Across the hull 188 speakers are distributed and play simultaneously interview fragments of different people. 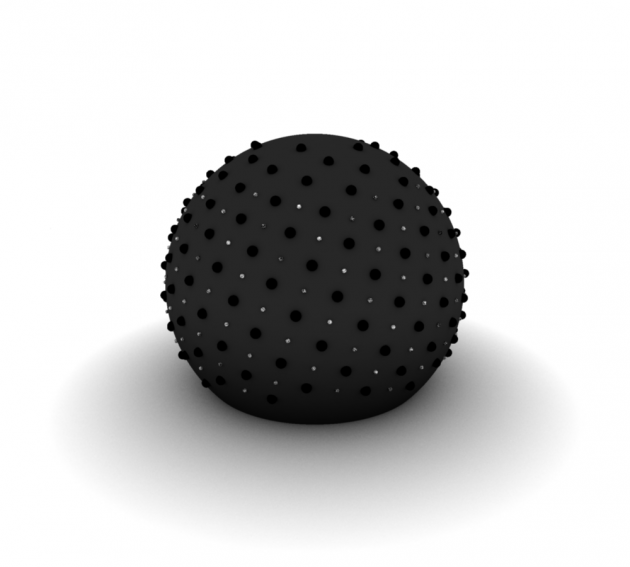 Presented in an dark environment the black sphere becomes an invisible object of whispers. My job was to find an interesting way of arranging the 188 speakers and an similar high number of peek holes across the sphere hull. After first considering sphere tessellation techniques, i decided to find an equal distribution for the 188 speakers across the sphere hull by implementing simple collision avoidance. 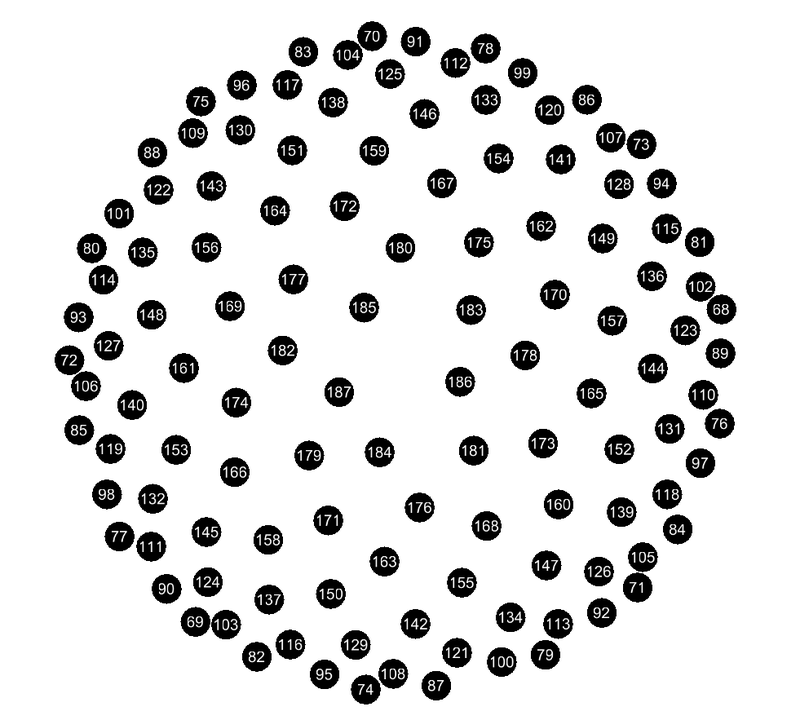 In a simulation i placed 188 nodes randomly on a sphere surface and in each iteration step the nodes tried to move away from each other if located too closely. At the end the system slowed down in a rather stable configuration. The results were interesting yet not satisfying enough. Giving the nodes/speakers characteristics based on their individual soundclips might have spiced the whole thing up a bit. 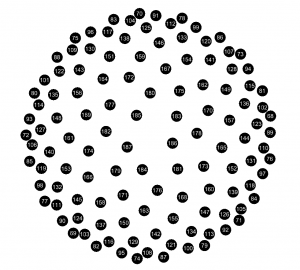 n is the index number of the floret and c is a constant scaling factor. 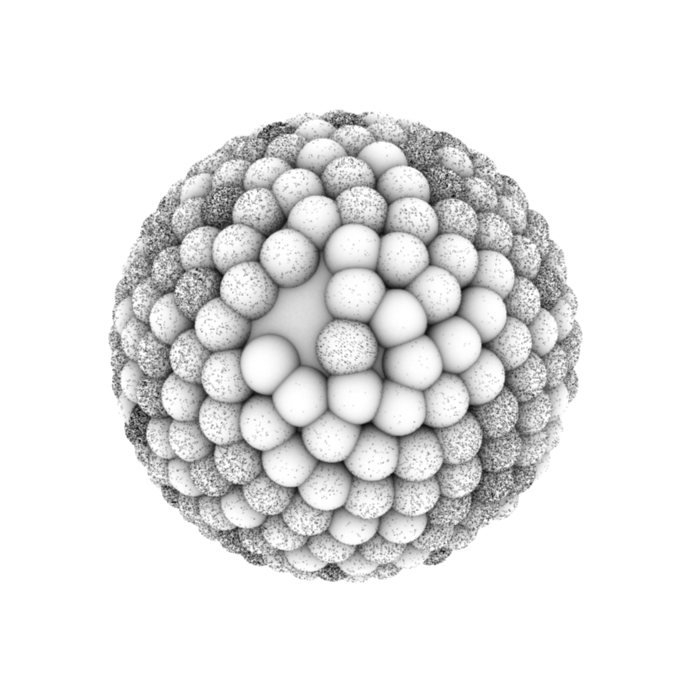 This allows the creation of a simple 2dimensional Phyllotaxis pattern in one computation step. 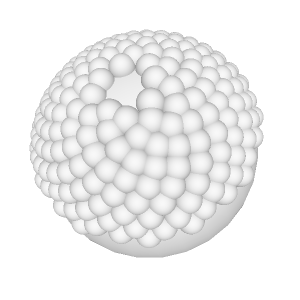 Trying to find an equivalent 3dimensional formula i stumbled upon golfballs with Phyllotaxis based dimple patterns (see patent). 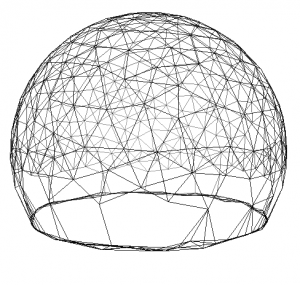 Yet the hardcoded solutions for sphere surfaces only truly work for hemispheres. 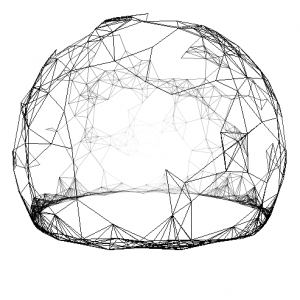 In order to achieve an evenly packed pattern across the whole sphere, you need to apply the formula once for the upper and then mirrored for the lower hemisphere. A solution more true to nature is in finding a dynamic way of achieving the phyllotactic pattern. 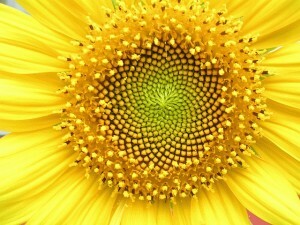 Sunflower seeds grow from the center, each released at an angle difference of 137.51° (golden angle). New seeds push the older seeds outwards and cause the spiral pattern to emerge. The simulation on the left shows an implementation of this idea into a simple 2dimensional setup. 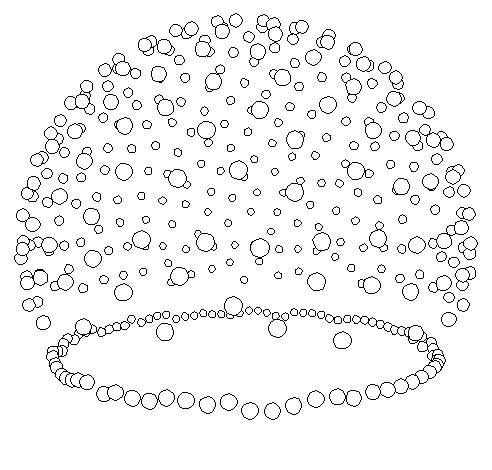 The red circles in the center resemble the newly released seeds. 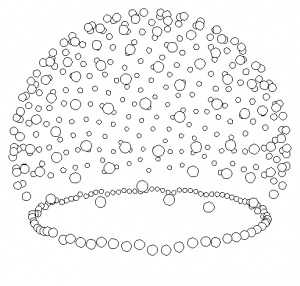 In each computation step an algorithm performs collision detection on all the seeds and moves them outwards from the center until they don’t intersect with other seeds anymore. In order to keep the golden angle arrangement, the seeds are not allowed to be pushed sideways and only move along their initially assigned angle line from the center. 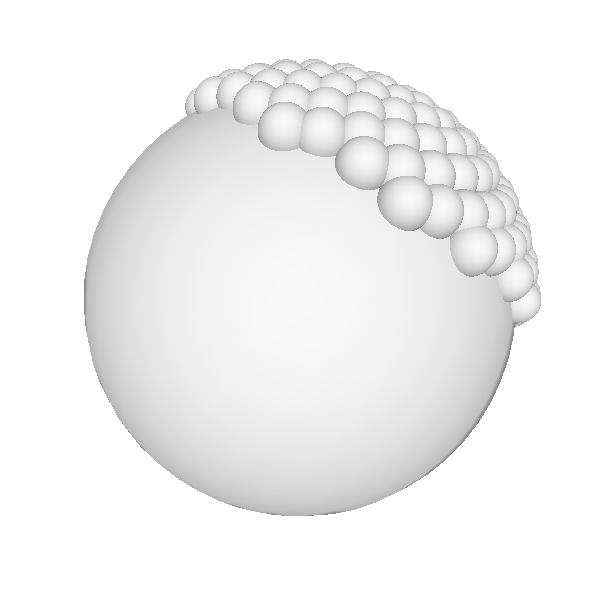 The same algorithm can be easily adapted for the 3dimensional sphere setup. In the simulation i released seeds as little spheres on top of the big sphere, at intervals of 137.51°. 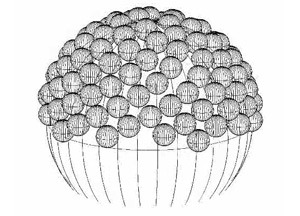 Per collisions detection the seeds pushed each other outwards and downwards along the surface of the sphere. 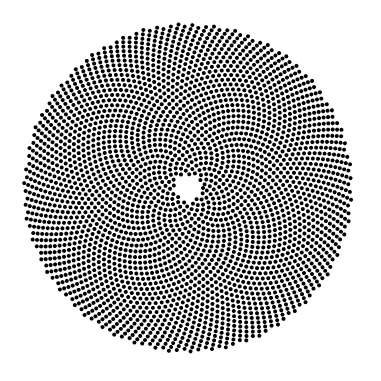 When reaching the lower hemisphere the seeds still naturally arranged along the spiral pattern. After several tryouts i managed to define an appropriate radius for the seed spheres that would allow the placement of about 188 seeds on the accessible surface of the big sphere (the basis of the cut-off sphere had to be deducted). After finding the placement for the 188 speakers, i interpolated those results to get coordinates for the peek holes that would be located in between the speakers. 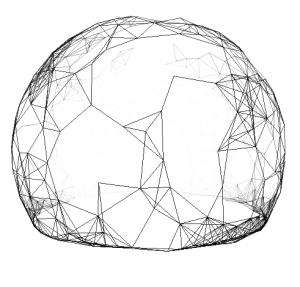 The audience would be able to peek into the inside of the sphere (where a statue made of incense would be slowly burning down over the course of the exhibition time). The image below on the left shows the speakers in black and the peek holes in white color. 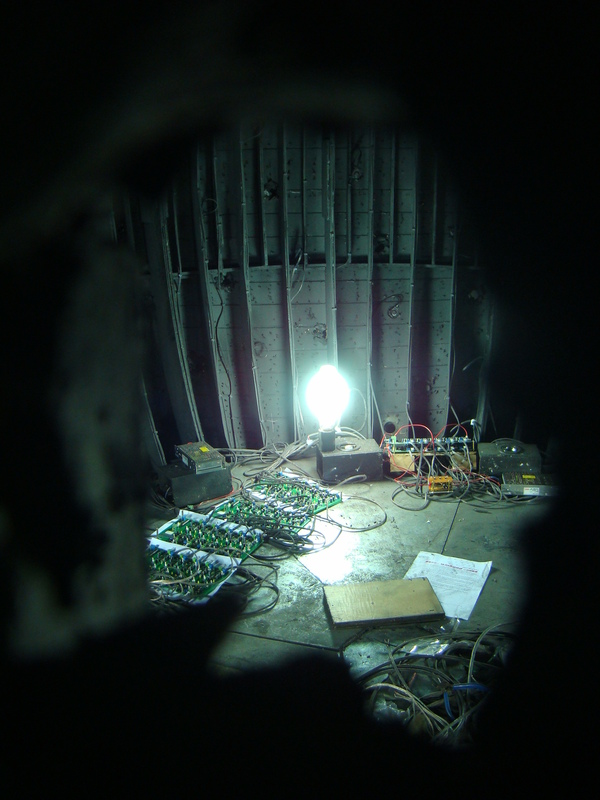 The final step was to output speakers and peek hole placements in coordinates that would allow the crew to easily implement them during construction of the installation. 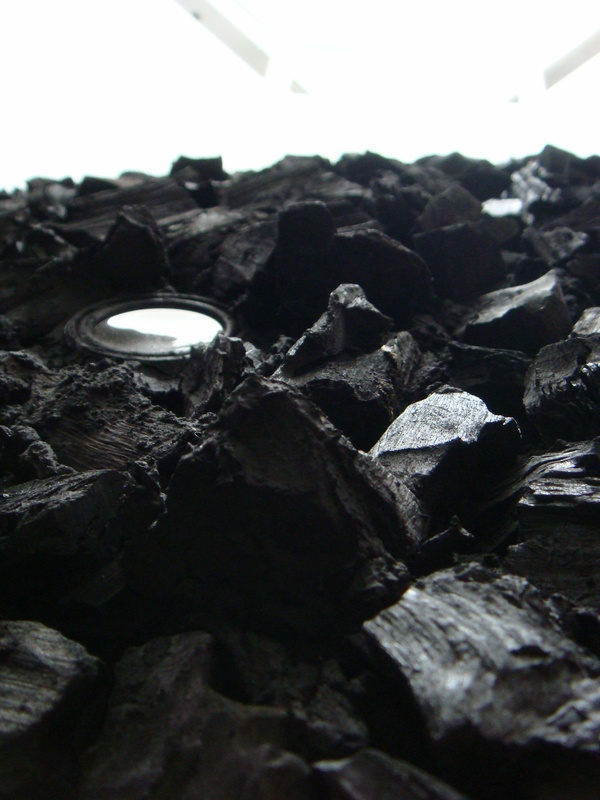 The image on the right shows a view from the top onto the speaker arrangement. The installation was exhibited at the 3rd Guangzhou Triennial during Sept-Nov 2008. Besides the speakers arrangement i was involved in editing soundclips, recording the soundchips (ISD) with a PD-patch, and installing the sound system on site. A closeup on the shiny speakers. Setting up the sound boards at the installation site. Posted in Projects and tagged 2008, computational design, installation, pattern formation, phyllotaxis, processing.